Microsoft Excel to Outlook Converter Software is designed to export Excel contacts to Outlook. It is stand-alone utility. Export Contact list, which are stored in Excel file, to MS Outlook with the help of Excel file to PST converter. This software is capable to convert all the contacts along with the details from Excel, which includes emails, Calendar entries, phone number and other details etc. Excel to Outlook converter, it is mandatory to proper mapping of the fields. With the help of mapping feature of this software, users can perform the conversion in a proper manner. They can save each detail in an appropriate way. For example, users can map first name in Excel with first name field of contact of Outlook. One of the essential features of this tool is that users can eliminate all the duplicate contacts. If any duplicate contact is available in the list of Excel file, this software excludes that contact automatically. Users can select any of the options i.e. include or exclude contacts as per their need. This software has one more very interesting feature According to this those contacts in the Excel file that have no email address i.e. have email field as empty or blank, then those contacts can be eliminated from the process of conversion. Users can include or exclude these contacts. Excel to PST Converter tool provide the option of creating Distribution list during contacts conversion. This Software allows the users to save converted contacts in a group for sending emails to the group of person. So you have to check the distribution list option and choose a name for it. While users export the contacts from XLS to MS Outlook, this tool will directly configure all the exported contacts into Outlook address book. Therefore, once the conversion is completed, open the profile of MS Outlook and click on the folder of contacts folder to view the exported contacts. “Thank for the development of such an unimaginable utility to convert Excel Contacts to MS Outlook. I am very happy with this tool especially with the interface of this tool. This tool supports all the versions of Windows and can migrate the contacts in bulk as well." XLS is an extension of a file for a spreadsheet format. It is developed by Microsoft for use with Microsoft Excel. This Excel sheet contains information in tabular form. On the other hand, Outlook is a desktop- based email client. Its contacts are saved in PST file format. Microsoft Outlook is an email client used in many organizations to maintain the continuity of the work. Users who are using Excel cannot use the contacts directly from there for cross-communication. Therefore, to establish an interaction from other organizations or users, a platform is required. Outlook can be one such platform where users can migrate the contacts from Excel. 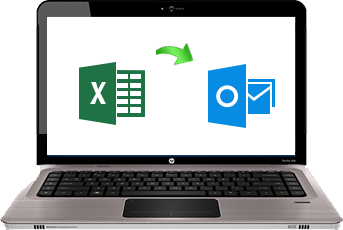 Migrate all the contacts of Excel to Microsoft Outlook in bulk at once. With the trail or Demo version of Excel to PST Converter, users can convert first five contacts from Excel to Outlook. To migrate contacts without any limitations users have to purchase the full or licensed version of the software.